Having a baby is a life-changing experience. Some things, however, don’t have to change—like the need to move around and the drive to exercise! There are specially designed baby strollers for jogging that are perfect for helping you stay in shape while your child is perfectly protected and comfortable. We feature an in-depth buying guide below, so you can learn all of the ins and outs of buying a baby jogger. If you’d like to zoom on through and see some top products at a glace, though, you can do that here too. We’ve selected 3 products that we think offer competitive features. The BOB Revolution Flex Jogging Stroller comes out on top of our featured strollers for jogging. Just what does this jogger offer? For one, this product is designed for maximum protection and comfort for the child. It has a suspension system that includes a padded seat and air-filled tires to ensure a smoother ride on even the most rugged terrain. It also features a front wheel that can swivel or be locked into place. This wheel design makes this buggy great for not just exercise, but every activities as well. This buggy also features a nice canopy that provides up to UPF 50+ protection from the sun, so your child can stay safe from harmful rays. This baby jogger also offers features that make it easy to use as well. The handlebar is adjustable, so parents can find the perfect comfy grip. Folding up and transporting this item is also a breeze with a 2-step folding system. 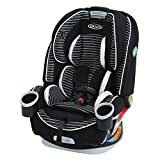 The company says this item can seat children from birth to 75 pounds, making it the item with the heaviest single-child weight capacity. However, for infants aged 0-8 weeks, a special adjustable infant seat adapter must be used. What’s nice about this item is that it folds back almost completely flat, which is great for babies still gaining the strength to support their own necks. Coming in 3 color options, interested individuals can buy this baby jogger for $349.99 on Amazon. This might seem a bit pricy, but we think the added features and comfort make this price tag reasonable. We give this jogger a great 9.3 rating. BOB once again delivers, this time with its Revolution Flex Duallie Jogging Stroller. For parents who have more than one kiddo to tote around, these might just be the best double strollers for the job. These joggers feature all of the same great features as the previously listed BOB product. However, this item has a weight capacity of 0 to 50 lbs. This item goes for $639.99 on Amazon when new, which can be a hefty investment. We give this product a 9.1 rating. 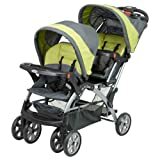 Active parents on the hunt for the bargain might find what they are looking for in the Baby Trend Expedition Jogger Stroller. 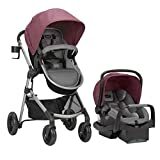 This buggy goes for $73.40 on Amazon brand new, although this is for the bubble gum color option only. Opt for either of the other two colors, and there will be a price jump. This stroller has large tires, including a front wheel that swivels normally until locked into place for jogging. A reclining seat makes this product safer for infants, who require this recline to support their necks. Other nice safety features include a 5-point harness, sun canopy, and tether. Parents will also enjoy that the front tray includes two cup holders, and that there is ample under-carriage storage space. The manufacturer sets the weight limit up to 50 pounds. Overall we give this product an 8.9 rating. Many new parents struggle when determining whether they should buy a jogging stroller or a regular stroller. There difference between the two becomes clear once parents have the opportunity to try out both. Choosing the right stroller is key because it's going to determine how comfortable and safe you and your baby will feel as you go about your day. Should You Choose a Regular or Jogging Stroller? When deciding whether to get a jogging or regular stroller, it helps to understand the structural differences between the two. They have three large, pneumatic rubber wheels filled with air. 16-inch rear wheels and 12-inch front wheels are standard. Large wheels make it easy to roll the stroller for long distances. They front wheels have a locking mechanism that makes it easy to run or jog while preventing them from wobbling and causing discomfort for both you and your baby. Most jogging strollers have a fixed wheel, but some do come with a swivel wheel. The swivel wheel option is best for people who need to have their jogging stroller double as a regular stroller. If you buy a jogging stroller with a fixed front wheel and you need to use it for everyday tasks, you will be disappointed. You will be forced to lift the front of the stroller in order to steer it around corners, through stores, and everything else! They have the ability to ride over tough terrain, including grass, dirt, and gravel. How can they do this? These types of strollers have great suspension, which means they provide a smooth ride over even the bumpiest terrain. This suspension makes these products perfect for activities like going up hills or running through parks. The suspension also helps cut down on the amount of jarring as you move the stroller about, absorbing most of the rough motion before it affects the baby. Additionally, the front wheel of a jogging stroller is located far away from your baby's bottom, allowing the front wheel to bounce when rolling over something rough or hard, preventing the baby from feeling any of that motion. They also usually have a single handlebar that makes it easy to maneuver the stroller with one hand. They have single or separate handlebars depending on the model. They most often come with four hard plastic wheels. They can be folded up easier than a jogging stroller. More ideal for smooth surfaces like flat pavement and Supermarket aisles. Once you understand the differences between the two types of strollers, it's a lot easier to determine which one is best for you. You need to choose one that will fit into your lifestyle seamlessly. You're a very active parent who loves to exercise often, including when you're out with the baby. The jogging baby carriage will give you the opportunity to move around easily while keeping both you and your baby comfortable. One thing you have to ensure is that your baby is at an age where it can comfortably support its neck and has sufficient core muscle strength. Because of this, most manufacturers recommend that you don't start using a jogging stroller until your baby is about 8 months old. You live in an area that has a lot of rugged hills, sand, or other types of rough terrain. A strolled for jogging will make your ride much smoother, making using a stroller a joy. You don't need tons of storage space to store your belongings as you go about your day. Jogging strollers tend to have much less storage space than regular strollers. They do have storage pockets, but they tend to not have the massive amounts of under-carriage space that regular strollers do. You need a stroller that is easier to fold. Jogging strollers in general are more difficult to fold down in a hurry than regular strollers, and that's assuming they can fold down at all. On most regular strollers, the two front wheels are designed to swivel. This feature makes it easier to move the stroller about when you're walking. Ironically, this same feature makes it difficult to move the stroller when you're moving at a fast pace, a key reason a regular stroller is not good for jogging. A regular stroller is ideal if you need a lot of storage space as you move about throughout your day. Regular strollers have tons of undercarriage and pocket storage space that makes it easy to store items like shopping bags, baby items and anything else you need while going about your day. This is ideal for people who live in big cities where walking from place to place to run errands is common. Once you've made your decision to get a jogging stroller, you'll need to determine what type of jogging stroller you're going to get. Following is a list of important features to keep in mind. Once you've made the decision to get a jogging stroller, you need to determine if you're going to get a single or double. A single jogging stroller is a unit for one child, while a double stroller is for anyone who has more than one child that he or she needs to tote about. don't exceed the total weight capacity. You might also want to look for models that allow the kids to recline or to sit up individually. If you live in a big city, make sure that the stroller can fit through standard doorways. This can be a major problem if you have an extremely wide double stroller. The five-point harness is the harness that secures your baby into his seat. It goes over his shoulder between the legs and across the hips. This positioning helps prevent injury in case you bump into something. It's the same type of 5-point harness as the one that's used in a baby's car seat. A safety tether is a strap that fastens from one end to the stroller and the other end is around your wrist. The wrist strap helps prevent your stroller from getting away from you if you're on a hill. It's important to make sure that the jogging stroller you choose has a safety tether. You'll be moving about a lot, and you want to make sure that your baby remains safe no matter what. The safety tether could help you prevent an accident from happening! The window allows you to be able to see your baby easily while you're jogging and moving about. It's easy to get lost in thought while running, and a mesh or clear plastic window helps keep peace of mind that you can easily see how your kid is doing. Having a flap or other type of barrier between your child and the sun is critical for protecting him or her against harmful UV ray exposure. Experts say that children younger than 6 months of age should not wear sunscreen. As such, making sure that there are other barriers to protect your child is absolutely necessary for his or her health. A reclining seat is going to keep your baby comfortable while you jog. We usually see baby sitting up straight while their parents are jogging, but a reclining seat allows him or her to lay back comfortably or even go to sleep. The idea is for both of you to feel comfortable at all times during your outing. Note, however, that most jogging varieties do not have a reclining option. Reclining seats, however, are a must for newborns and infants, as they cannot support their neck on their own. Experts therefore say that most of these jogging strollers are not appropriate for children until they are old enough to properly support themselves, which is about 6 months of age. As with all strollers, you want to make sure that your jogging variety has a parking brake. Make sure that you choose a stroller that makes it easy to see if the parking brake is in park before you walk away from the stroller, and never leave the baby unattended. Choose a jogging stroller that has a deep cup holder. You want to make sure that if you're going over a rough bump or a particularly rugged area, a drink does not spill, possibly even all over your baby. This is one of the most important features you need to consider. 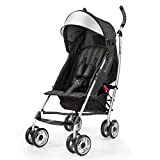 As mentioned above, if you're going to be jogging mostly with your stroller, you need to get a jogging stroller that has a permanently fixed front wheel. It is critical that that front wheel stay in locked mode during exercise activities. It will keep the stroller aligned in straight, and will prevent it from shooting off into other direction suddenly. A fixed front wheel will not allow you to make sudden sharp turns, preventing the stroller from suddenly tipping over. The swivel wheel is only ideal for people who use their stroller for both exercise and day-to-day activities. If you are using it as both, you need to make sure that you remember to lock, and subsequently unlock, the front wheel based on usage. It needs to be common automatic motion for you. Those who live in urban areas can therefore these type of running buggies useful, not just for exercise but also for trips to the grocery store. Rear wheels are almost always fixed. An adjustable tracking mechanism on a jogging stroller keeps the front wheel running straight. It’s similar to the front-end alignment that you get on your car. If the stroller suddenly moves over to one side while it’s running on a flat surface, this adjustment mechanism helps you keep the unit’s front-wheel tracking straight. You probably noticed with some strollers that if it starts to swerve to the side suddenly, you have to maneuver it back in line with your own strength, creating arm fatigue. This adjustable tracking mechanism prevents you from having to do all of that. If you want something that is easy to push, opt for something that has an adjustable handlebar. Single bars are typically preferable to double handle bars, as a single bar is easier to grab when running. Some strollers even come with a hand brake, which can make stopping on short notice that much easier. When taking it easy, a good jogging stroller with an adjustable locking wheel is great for everyday use. If you are going to buy something that can double as an everyday stroller, consider looking for one that has a nice snack tray. This way, your kid doesn’t have to miss snack time when you run errands together. Storage space can be important, especially when you have lots of baby gear to tote around. Sure, it’s easy enough to find a diaper bag with a large comfortable strap, but even that can get heavy after awhile. An under-carriage compartment is a great place to put your stuff. Those who have air-filled tires should also look for something, under-carriage storage or something else, that can carry a tire pump, just in case the wheels need adjusting. Well-built baby strollers can cost several hundred dollars. While there are some cheaper options out there, if a deal seems too good to be true, be wary: the cheaper price tag might be due to sub-quality manufacturing. Don't try to cheap out on quality because a better-made stroller will last you a long time and keep your child safer in the long run. A well-built stroller will last for years, perfect for families that are constantly growing! Choosing a jogging stroller is an important decision. Choosing the right one can make all the difference in your and your baby's enjoyment and well-being. 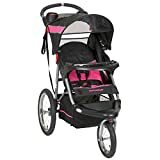 Those looking for a baby jogger for the city might have different preferences than somebody looking for a high-quality buggy for terrain that is more rugged. Choose wisely!